Fleet 17’s 2018 Texas J/105 Invitational, held March 17-18, is now in the books. The combination of the J/22 Midwinter Championship at Houston Yacht Club and Spring Break reduced the number of boats from an initial eight to four. Still, the regatta was a great success and loads of fun. And Race Management by Lakewood Yacht Club was exceptional under light, shifty conditions. Bee Bednar and John Barnett drove Stinger to a 3,1,1,1,1, 2,2 for an overall first place finish. Uzi Ozeri and Matt Arno helmed Infinity to a 2,3,2,2, 2,1,1 for second, and Chuck Wielchowsky and John Bell finished third on Texas Ranger IV with a 1,2,4,4,3,3,3. Racing was always close, including all boats overlapped (or close to it) at the finish in race five. 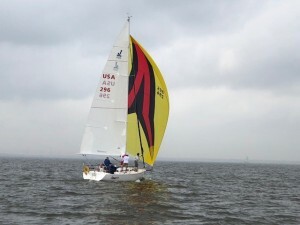 Under the Invitational format, each boat has two helmsmen—the Fleet 17 owner of the boat helms the odd races and the guest skipper helms the even races. Fleet 17 plans to continue this Invitational regatta with a future that includes guest skippers from a wider range of boats. The idea is to introduce potential new owners to the J/105 in a way that provides a bit of fun and experience to all.